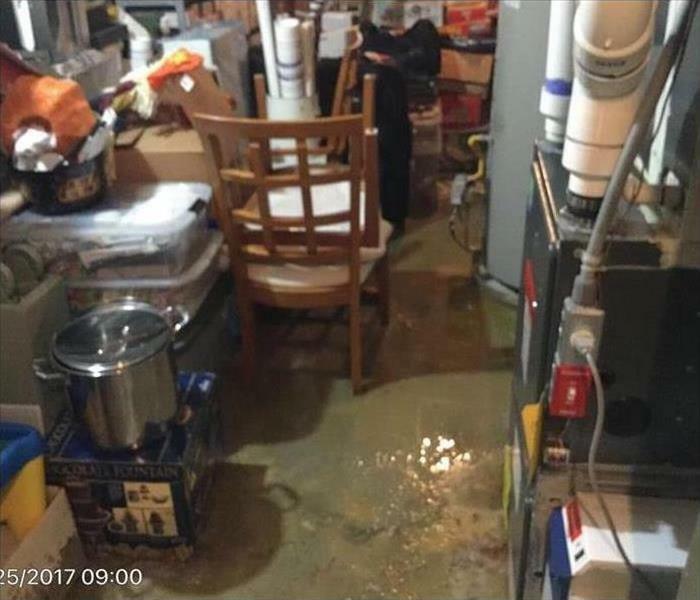 The flooding in this Edgewater home was caused by heavy rain runoff. Edgewater had received over several inches of rain that week and it overwhelmed the system. Water behind the wall from runoff. Even though SERVPRO of South Jersey City/Bayonne was called in to dry out a commercial building which had wet carpets from a water purifier, we took the initiative to take care on an ongoing issue behind the walls. The water originated from improper run off due to the building's gutters and outside slope. We picked up some leader extensions so that the water would run away from the building. As you can see, overtime the water had run behind the walls causing the paint to peel. SERVPRO of South Jersey City/Bayonne will always provide you with advice to avoid future losses and develop an emergency ready plan for you. Mold from moisture can hide behind the wallpaper. Water leaks and moisture are not always present in areas which are visible to home and business owners. Over time, slow leaks and high levels of humidity can cause mold to form under floors, behind walls and in air ducts. SERVPRO of South Jersey City/Bayonne's expertly trained water mitigation technicians were called out to a home which had a water loss due to a broken sprinkler head. Once the crew started to remove the wallpaper, they realized mold had formed after a former slow leak from the air conditioning system. 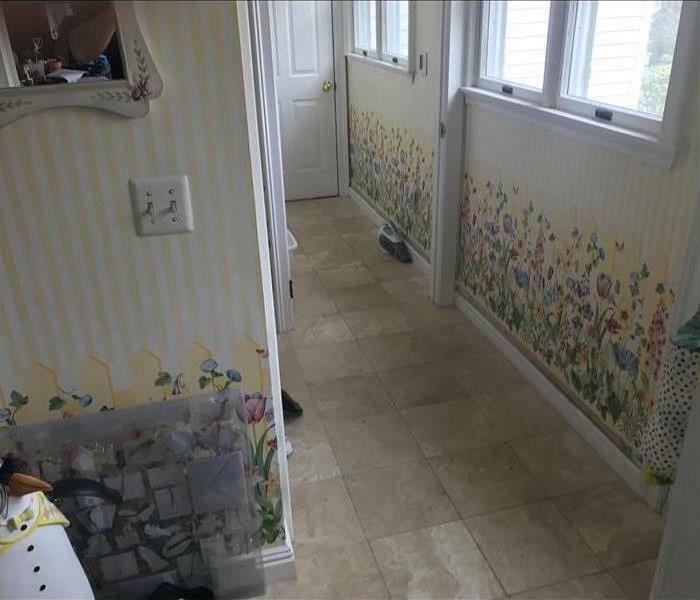 This room looks like it's fine but a closer inspection shows mold is growing under the wall paper. If your walls are wet and the wall paper remains in place, it can act as a vapor barrier preventing the drying process from occurring. Chances are the insulation behind the wall is also affected. Water will wick up a wall 1" per hour for the first 12 hours. SERVPRO is always ready to take care of homes and businesses affected by disaster. Call us at 201-333-3200, 24 hours a day, and seven days a week. 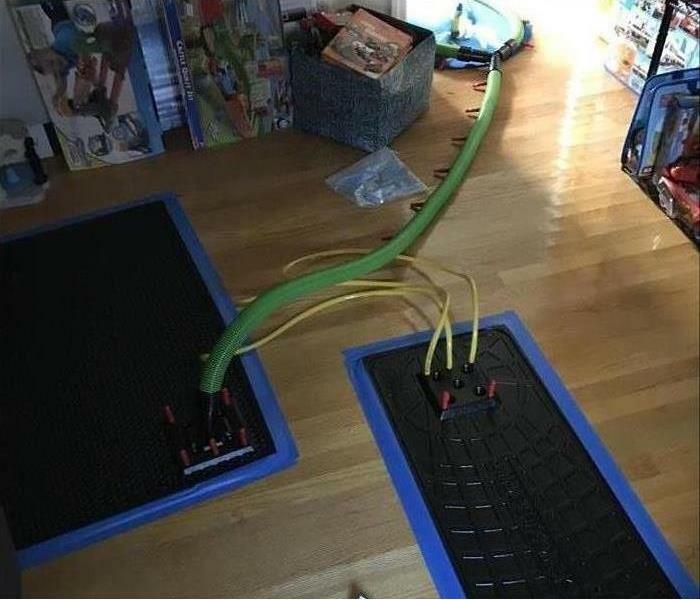 Wood flooring saved using drying mats. When this 3 story Weehawkin home was flooded, the insurance agent said he did not think we could save the floors. He was surprised that we saved every floor and we did not have to make the homeowners move out to demo. The insurance company and the homeowner were thrilled with the work our folks did. SERVPRO of South Jersey City/Bayonne is available 24 hours a day for water emergencies, large or small. When you are dealing with water damage, immediate action is crucial. A delay of just a few hours can greatly increase the severity of the water damage. We understand that when you call us, you may be feeling confused, stressed, and vulnerable. You need an expert to guide you through this crisis. SERVPRO of South Jersey City/Bayonne has the specific water damage training and experience to help you through this tough time. We specialize in water damage restoration—in fact, it's the cornerstone of our business. SERVPRO of South Jersey City/Bayonne specializes in the cleanup and restoration of residential and commercial property after a fire, smoke or water damage event. 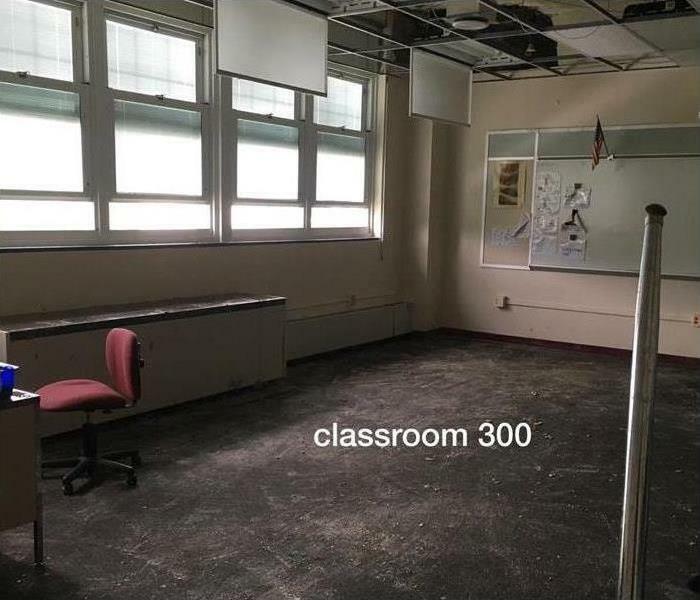 When a local high school suffered a water main break on the 4th floor which flooded out 3 class rooms, they called SERVPRO of South Jersey City/Bayonne to dry out the affected areas. 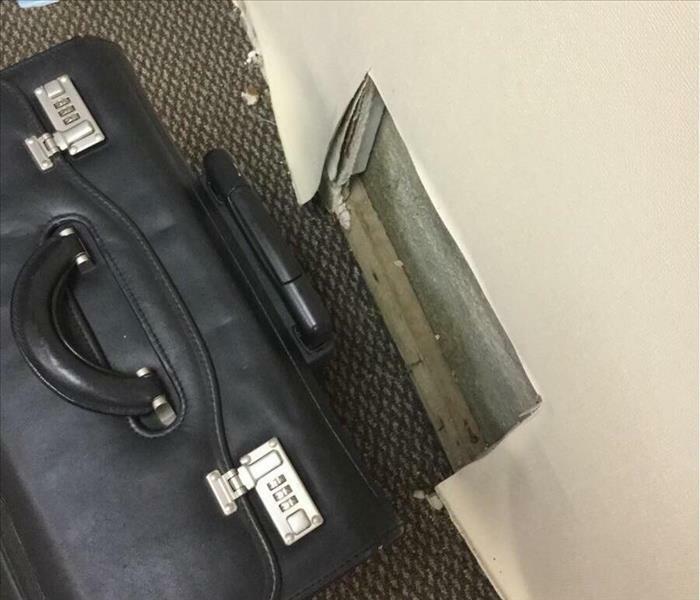 Our team was able to remediate the damage, all while working around classrooms in session in the rest of the building. Our certified ASD water professionals were on site within 1 hour to set up containment and place equipment along with air scrubbers to assure that students were provided with a safe environment. Rest assured that when your municipal township or local school district calls on SERVPRO of South Jersey City/Bayonne, we will be on site quickly to stabilize and restore your buildings using proper mitigation protocol according to industry standards. SERPVRO of South Jersey City/Bayonne is open 24 hours a day, 7 days a week to handle the largest and most complex water restoration project. Call us anytime at 201-333-3200. Always remove standing water right away. Flooding and water emergencies don’t wait for regular business hours and neither do we. SERVPRO of South Jersey City/Bayonne provides emergency cleaning and restoration services 24 hours a day, 7 days a week—including all holidays. Flooding and water damage is very invasive. Water quickly spreads throughout your home and gets absorbed into floors, walls, furniture, and more. SERVPRO of South Jersey City/Bayonne arrives quickly and starts the water extraction process almost immediately. This immediate response helps to minimize the damage and the cleaning and restoration costs. SERVPRO of South Jersey City/Bayonne specializes in the cleanup and restoration of residential and commercial property after a fire, smoke or water damage event. Our staff is highly trained in property damage restoration. From initial and ongoing training at SERVPRO’s corporate training facility to regular IICRC-industry certification, rest assured our staff is equipped with the knowledge to restore your property. Contents needed to be moved out before mitigation started. 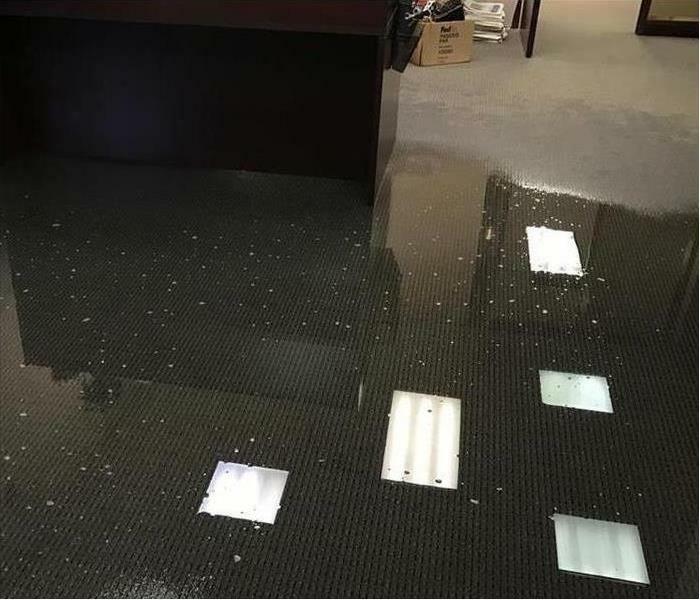 A sprinkler line broke and damaged 25 offices in Hoboken, NJ. We had them up and running in less than a month. 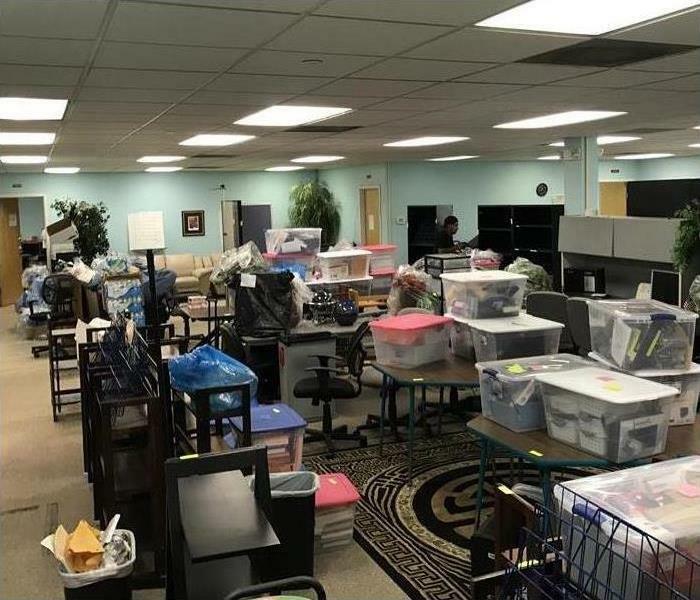 Allison was so happy with how quickly we responded and deployed a team of SERVPRO of South Jersey City/Bayonne staff who showed up on a Sunday to get her packed up and moved out to temporary storage and office space. SERVPRO of South Jersey City/Bayonne specializes in the cleanup and restoration of commercial and residential property after a water damage event. Our staff is highly trained in property damage restoration. From initial and ongoing training at SERVPRO’s corporate training facility to regular IICRC-industry certification, rest assured our staff is equipped with the knowledge to restore your property. No matter what business you work in, teamwork and proper ethics are essential to running a successful business. Here at SERVPRO of South Jersey City/Bayonne, our team is fortunate to have a warm, yet effective working relationship with each other. Considering we are an emergency business, it is imperative communication is clear between the office, field technicians and project managers. During a surge in business due to a disaster event, proper communication and execution allow our franchise to respond to more calls efficiently. One of our greatest strengths here at SERVPRO of South Jersey City/Bayonne is the camaraderie shared within our entire staff. The positive relationship amongst each other provides a pleasant working experience which is then passed on to our customers throughout the day. Evidence of our work environment radiates throughout our business and the communities we serve; the office staff receives numerous complements about our chief technicians on a regular basis. Visit our testimonial page to see what our customers say about SERVPRO of South Jersey City/Bayonne in action! Don’t let an electrical fire inflict significant damage on your home and belongings! Our SERVPRO of South Jersey City/Bayonne team was called out to a local home which had a fire originating in the kitchen due to an electrical spark. Excessive soot and smoke overtook the majority of the one-level property. Upon arrival, our fire experts started an inventory of damaged contents and prepared a plan of action to clean and restore the home to a pre-fire condition. Carpet, drywall, insulation, appliances and cabinets needed to be removed, soot stained walls were wiped, and remaining stud walls were thermal fogged to remove any lingering fire smells. The tile floor was heavily covered in a dense layer of soot and needed to be given an extensive cleaning. The homeowner was amazed with the resulting clean floor and could not believe it had been restored as if the fire never happened! Ever so grateful for the quick response and professional cleaning from SERVPRO of South Jersey City/ Bayonne, the homeowner let us know she would recommend us to all her friends and family! In the instance fire affects your home or business, call us at 201-333-3200: our SERVPRO expert fire team will have your recovery covered! To The Rescue after A Hurricane! 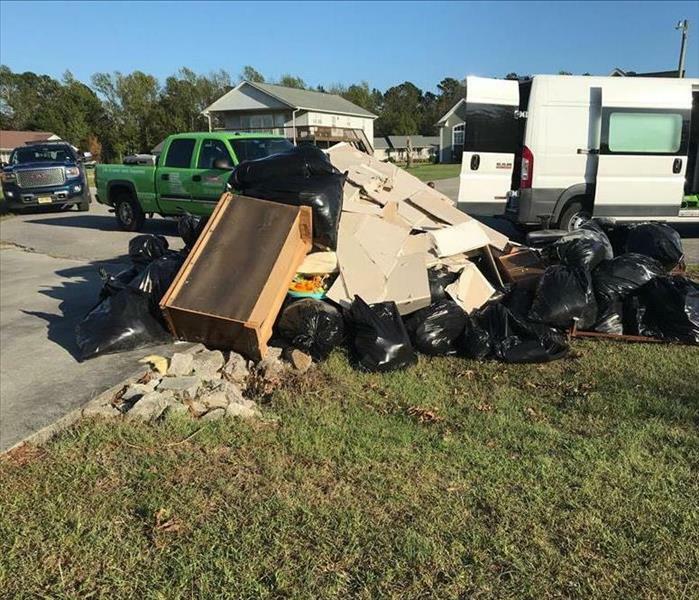 Our crew assisting with clean up after a hurricane. After Hurricane Florence caused severe flooding and wind damage to the Carolinas, our professional SERVPRO of South Jersey City/Bayonne team headed south from New Jersey to assist with the recovery effort. Many homes had suffered from roof damage due to the high wind speed. Other homes were damaged from the seepage of floodwater which was heavily soiled with contaminants. A vast majority of structures needed extensive interior demolition while those with extreme structural damage were scheduled for complete demolition at a later time. Our SERVPRO team started work immediately, removing wet materials such as drywall, trim, insulation, hardwood floor, carpet, padding and vinyl. They sprayed antimicrobial to prevent unwanted microbial growth and placed drying equipment to remove moisture from the remaining structural components. Once the structures were dry in three days, customers were able to schedule needed repairs quickly. 4/8/2019 - Another Floor Saved! 3/29/2019 - Electrical Fire Emergency Recovery! 11/7/2018 - To The Rescue after A Hurricane!